Images: Gushing Falls Lg. 043G, Cloud w/Moon 105E, Lakeside Reflections Lg. 051G, Foliage Lg. 036B, Reeds Lg. 068D, Row Boat 166A, and color application with the Tonal Applicator 084E. Note: The lighting scheme has been defined by the usage of deep rich hue and tone. 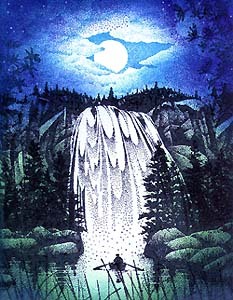 The water being left the white of the paper reinforces the reflective quality of the element against the darker less reflective stone of the mountain.